Home › Stories › Fruitful Surgery Of 10 Hours By Professional Surgeons Make This Kid Move His Limbs! Fruitful Surgery Of 10 Hours By Professional Surgeons Make This Kid Move His Limbs! This is surely a heart moving story as Zion Harvey has a complication with his hands making it difficult for him to grab things and move his fingers freely. To him that does not matter since a month ago, he wasn’t able to make any motion with his hands completely. Harvey has been in this condition for nearly all his life, now that he is 8 years old. Due to a septic infection while still a baby, he lost his hands and feet, making him learn to operate without limbs from childhood, a thing most people look to as a joke. At the Children’s Hospital of Philadelphia, Zion received a double hand transplant, and was declared the first child to have received that thanks to the pediatric surgeons. Her mother confessed that she cried when she first saw his son with the hands. Formerly she had taken him to a nearby hospital in search for a better prosthetics where the doctors realized in no time that what Zion needed was surgery to which they immediately started to look for a donor. Just like this girl who got a transplant of lungs, Zion had had to be patient till a donor with matching hands was found for the transplant. 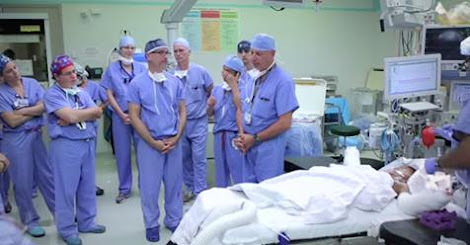 At the beginning of the moth, a group of 40 surgeons took 10 hours to get the new hands fixed. Being in physical therapy three to five times a day, has made Zion progress rapidly. He still hopes that his dream comes true which is throwing a ball like his idol quarterback Joe Flacco, to which the doctors say that it will be possible once he finishes with the rehabilitation. Don’t you think these surgeons performed a miracle? If you are touched by this story, SHARE it with all your friends out there!